Aviv model 400 Circular Dichroism Spectrometer records CD as a function of wavelength, time, temperature, pH and concentration using a double monochromator containing two UV grade prisms as dispersing elements. Right and left circularly polarized light is produced by a 50 KHz photoelastic modulator. The instrument includes CD software by AVIV for instrument control, data acquisition, processing and publication quality presentations in a Windows-XPenvironment. All experiment parameters are accessed through pull down menus. Control panels allow easy entry of all data acquisition parameters. Air-cooled CD System. Wavelength Range: 165 nm to 900 nm. Optional to 1200nm. Stray Light: Less than 0.005% at 200 nm, less than 0.1% over operating limits. 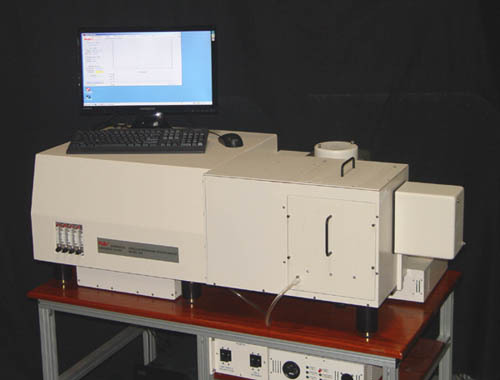 This 400 CD spectrometer is controlled by AVIV Pentium-4 PC & Windows-XP Pro based Model-400 CD program software. 115VAC, 60Hz. More information avilable upon request.